Thank goodness the holidays are over, friends. Each year I feel they get a little more emotionally draining for me and I wonder if it will get any "better" or if I just have a lot going on. Anyway, how is everyone doing now that it is officially 2014? Any progress on your resolutions yet? 2013 was a strange year for me- emotionally and mentally very little growth happened for me. I did have the opportunity to discover that I no longer need my anti-depressants to function like a normal adult. I am grateful for that, very much. I was in a dark place and it was really scary, but through a lot of patience (on Brian's part) and forgiveness of my short-comings, I was able to realize that most of my issues were not so much depression as lack of growth. Moving to a new apartment really helped kick start things for me in that area and since August, I have been off my medicine. I still have days where I am not myself, but those days are fewer and becoming farther apart. In late October, I went to my doctor and asked him if he would be willing to prescribe me a new weight loss drug. I had heard and read about a lot of people having success with it with very little effort on their part and I wanted to try it. For the most part, it is an appetite suppressant but it also has the benefit of helping with migraines. I suffer from migraines a lot- around 2-3 of them a month is average for me, and it usually ends up with me curled up in bed sobbing with an ice pack, or slumped in front of the toilet vomiting. Light sensitivity is a huge thing for me when I am experiencing a migraine and trying to raise a toddler while having a migraine... not good. I was started on a trial dose and it helped greatly with my migraines and my appetite and while I didn't start seeing any sort of weight loss until I was on the full dose, I can say that after 1 month of being on the full dosage I have lost 12 lbs. It's a fantastic feeling. I feel like I finally have the thing that has clicked for me. I am counting calories and I occasionally exercise, so this in combination is really what is driving it home for me. 2014 has been a mix of good and bad so far- I realize it's only the 3rd day of the new year, but hey, that's how life goes. I bought a bunch of Kindle books with an Amazon gift card I got, and I have been reading so much more. My soul is so happy because of this. Honestly, if I had read half as much as I have this year, last year, I would have been surprised. I am already through 2 books. I started drawing again. I just do 30 minutes a day. Doodle and then flesh it out a bit. I have been working so much more. I have a renewed interest in making as much money as I can and saving, as I want to be able to travel this year. I already set out a couple of places I want to go, so I've made little savings jars for them and working while I have those vacations in mind makes it easier to focus. 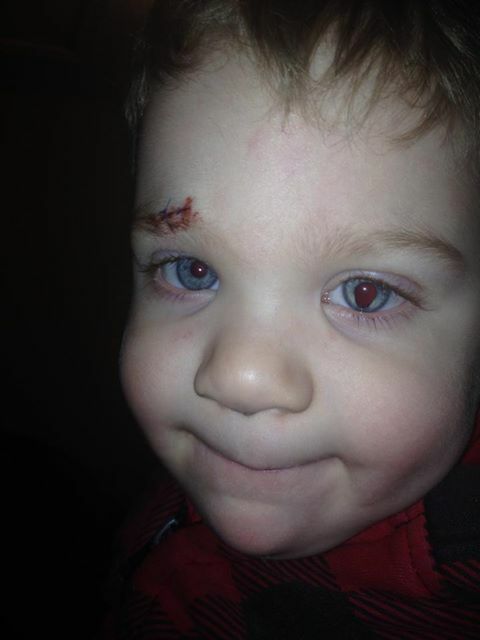 Drake had to get 2 stitches on New Years Day. Brian had his company Christmas party that day and I had worked all night long and didn't get any sleep. He decided that he and Drake were going to go and it would be no big deal. As soon as they got there, Drake ran smack into a metal-edged table and sliced his eyebrow open. They were at the ER for over 2 hours. I was asleep the whole time and didn't know. Not like it would have helped any, Brian said, since we only have one car and I couldn't have got there anyhow. So he's okay, and he leaves them alone, which is nice. I feel bad for him though, his birthday is in 2 days and he had to fall face first into a table and screw up his face. Oh well, he is a boy and that is what boys do. Children are surprisingly hardy little creatures so I am trying not to worry over it. I'm also trying not to feel guilty, because I am sure it would have happened regardless if I was there or not. It's adorable because the way that the stitches are placed, it makes him look all puppy dog eyes and sad all the time.